There aren’t many techno producers that I immediately associate with particular tracks; when I think of Ben Klock, for instance, ‘Sub-Zero’ isn’t the first thing to spring to mind, and if someone mentions Shifted I don’t instantly think of ‘Control’. Whenever I think of Ø [Phase], however, I can’t help but think of ‘Binary Opposition (Process One)‘ and ‘Binary Opposition (Process Two)’, for my money two of the most monstrously huge tracks in recent techno history. Released on Belgian label Token in 2012, the two ‘Binary Opposition’ tracks are two variations on the same basic theme: the pulsating bass rhythms, loops of static-laced percussion and metallic synth textures that make up the tracks don’t stand out as particularly original in the world of dark techno, but in this case the whole is definitely more than the sum of its parts, and taken together the Binary Opposition EP has always sounded to me like the perfect crystallization of a particular techno sound, an ur-example of the kind of throbbing, shadowy dance music that has come to define what “techno” means in the 21st century – an impression that was only bolstered by the Binary Opposition remix EP released shortly afterwards, which featured top-shelf remixes from luminaries such as Ben Klock, Planetary Assault Systems and Peter Van Hoesen. Of course, there is more to Ø [Phase] as a DJ and producer than just those two tracks. The London-based artist (real name Ashley Burchett) has been making high-quality techno of a tough and steely nature for decades now, with dozens of releases to his name, and though for some reason he has never quite achieved the same degree of underground superstardom as some of his contemporaries he is nonetheless a master craftsman of greyscale techno. Ø [Phase]’s Binary Opposition EP is in my opinion one of the best techno releases of the decade. The venue he was playing in on Saturday night, Beton Brut, is one of the techno joints in Seoul I have often – and unfairly – overlooked. It’s located in Itaewon, just a few doors up the hill from Faust. The club recently underwent some significant renovations, with Beton Brut itself moving into the basement of the building and two smaller bar zones (Rebus and Concrete Bar) apparently opening up on the first and second floors; I say ‘apparently’ because I have yet to see the latter two spaces – on Saturday I was pretty much glued to the dancefloor the entire time. It’s an integral part of the ecology of Seoul techno, alongside vurt. and Volnost; clubs that act as competitors, but also work alongside each other to bolster the local scene (Faust attempts to set itself apart from this scene in certain ways, which I don’t really agree with, but that’s a topic for another time). Behind the bar at Beton Brut. 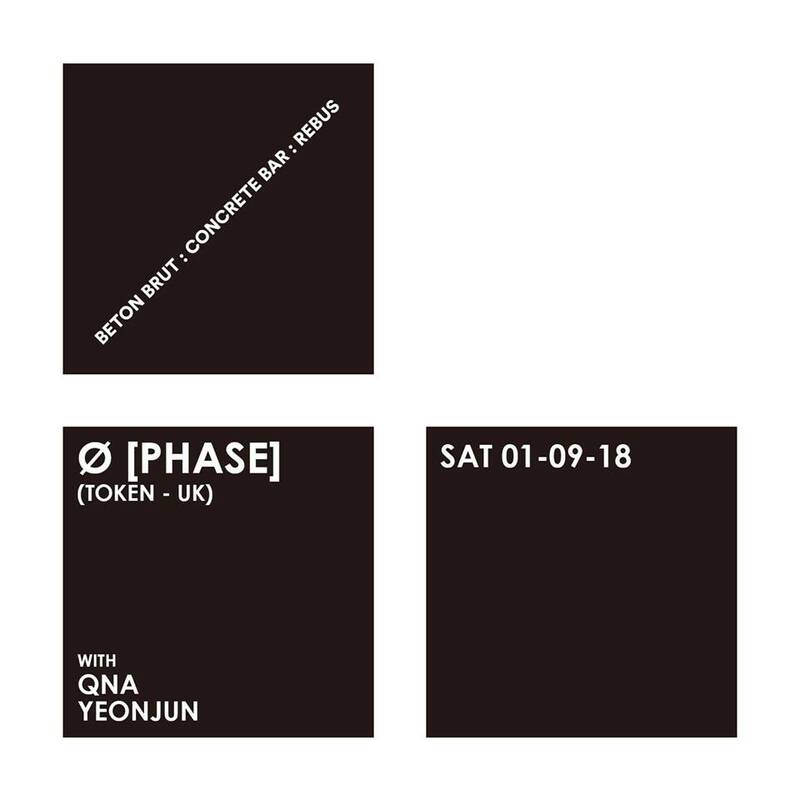 When you pay your entrance fee at Beton Brut, you’re given a ticket entitling you to a free drink, common practice at Seoul clubs. What sets Beton Brut a little bit apart, however, is that instead of choosing from a fairly limited set list of free drinks, Beton Brut allows you to choose any drink from the menu as long as it’s under 10 000 won – which, in practice, is most of the drinks available. It’s a small thing but something I really appreciated. After slugging back my free shot of Fireball (I have pleb taste in alcohol, don’t judge me), I ventured onto the dancefloor. It’s probably one of the darkest dancefloors I’ve ever had the pleasure of dancing on, in a totally literal sense – the basement space was black as a moonless night, save for the ominous red glow of the DJ booth and a couple of of intermittently flashing red and white lights near the front. The near-total darkness reminded me a lot of Mystik (RIP), and I have to wonder if the resemblance to such a legendary Seoul venue was deliberate. With it’s high ceiling, bare concrete walls and row of gigantic extractor fans behind the DJ, Beton Brut nailed the “industrial” aesthetic better than any other club I’ve been to in Seoul, and the shadowy nature of the dancefloor meant that I didn’t really waste much time or energy checking out my fellow clubbers, saving me from distraction and allowing me to focus my attention on the music. Warm-up DJ Qna was keeping things at a pretty even pace, playing a selection sludgey, textured tunes that encouraged the listener to close their eyes and drift along to the river of darkness flowing from every speaker. He never ramped things up to too frenetic a pace or tried to get too dramatic with his drops and mixes, which is a good thing in my book – too many opening DJs seem to forget that they’re there to set the scene for the headliner and create an appropriate sense of atmosphere and ambience, and instead tire the crowd out with banger after ill-chosen banger. There was no such egotistical behaviour from Qna, a man who seems well accustomed to the subtle art of the opening set. “Textured” is a word I want to use again to describe a lot of the tracks Ø [Phase] played when he took over from Qna, around 2:30 am. He kept things firmly in the deep end to start with, playing tracks that were slightly faster and more energetic than those favored by Qna, but that were still wrapped in similar ghostly shrouds of sculpted sound and anchored by similarly crushingly heavy kicks. As the set drew on, however, the tone gradually shifted track by track, until at some point – I’m still not sure quite how he got there – Ø [Phase] was playing tunes that could have worked just as well in a particularly dark and aggressive UK funky set, hyper-percussive polyrhythmic techno tracks that made me dance until my legs hurt and kept my feet tapping even when I sat down to take a break. By this time the club had filled up considerably, and by the time it got to 3:30 am the dancefloor had achieved what I think of as perfect density – when there are enough people dancing around you that the place feels full, but spread out enough that it’s possible to move from any given point on the floor to any other point without having to bump or push anyone out of the way. The only time I realised just how many people were in Beton Brut was when I went to the toilet, where I had to stand in line for way longer than I had expected. Ø [Phase] working the decks. By around 4 or 4:30 a.m., the shift from cerebral deep techno to full-blown warehouse bangers had been completed, and Ø [Phase]’s set began to enter true peak-time mode as he threw down storming tracks such as Blawan’s ‘Careless’ (one of the standout numbers from this year’s debut album Wet Will Always Dry) or Dark Sky’s huge techno/UK house crossover hit ‘The Lick’, fingers flying over the four decks in front of him. I should mention here that Ø [Phase]’s mixing is damn near flawless. His blends and transitions are verrrrry smooth indeed, the kind of ‘couture mixing’ that makes it almost impossible to distinguish the beginning of one track from the end of another. The crowd responded well to him – lots of hands in the air, lots of big smiles, several dudes who felt so moved by the music they felt the need to whip their shirts off – and there was a real sense of camaraderie in the air, the ecstatic communion of strangers coming together to move to the same relentless beat. My experience made me regret that I’ve been neglecting Beton Brut for so long – it’s a really good venue, one that ticks all the right boxes, from the quality of the resident DJs and soundsystem to the price of drinks. Like Ø [Phase] himself, Beton Brut perhaps suffers a little from being overlooked due to the sheer quantity and quality of the competition, but, as Saturday night proved, both Ø [Phase] and Beton Brut are more than capable of delivering a night of world-class pure techno.